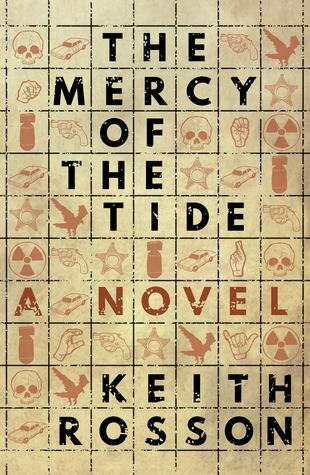 I was provided with an ARC copy of The Mercy of the Tide, by the publisher in exchange for an honest review. I wasn’t sure what to expect, but I was pleasantly surprised. Debut novelist, Keith Rosson, has delivered a riveting character-driven tale that crosses the line between mild horror and alternate reality. Set in the small seaside town of Riptide Oregon, the time is late 1983. The town is grieving the loss of two women killed in a head-on car crash, leaving siblings Trina and Sam Finster motherless and Sheriff Dave Dobbs a widower. The blame for the accident is firmly laid on Melissa Finster, after beer cans are discovered in the back of the wreck, causing more anguish for her devastated family. The story is told from the point of view of four characters in alternating chapters: eighteen-year-old Sam Finster, his nine-year-old sister Trina Finster who is profoundly deaf, Sheriff Dave Dobbs, and Deputy Nick Hayslip, a Vietnam veteran who grieves for Melissa Finster in secrecy, unable to reveal their affair in light of the tragedy. Rosson’s characters are well-drawn and believable, each dealing with their grief in their own way, each with their own personality and their own voice, and the addition of several interesting secondary characters only makes the narrative stronger. I thought each of the characters was relatable, although I probably felt the least connection with Trina Finster, who deals with the loss of her mother by obsessing about the possibility of nuclear war, which seems an unlikely reaction for a nine-year-old, even a gifted one. As the story unfolds, mutilated corpses of birds and animals are found about town and fear grips the tiny community, wondering what sort of animal or human could be responsible. However the discovery of a hundred-year-old skeleton of a Native American girl leads Deputy Hayslip to suspect that something darker and much more ancient is at work. The descriptions in this novel are vivid. Rosson paints a picture of the town that is dark and cold and windswept, a fitting backdrop to the grief and melancholy that dominates the characters’ thoughts. I did feel the book was a bit of a slow burn, as the tension didn’t really build until the second half, the first half dedicated to setting the scene and building the characters. However, this didn’t seem to detract from the narrative. I kept turning the pages, and when the suspense rose to the ultimate climate, I was invested in the characters and genuinely anxious for their fate. Overall, a highly enjoyable read. Recommended for readers who enjoy alternate reality, supernatural themes and mild horror. The Dry, by Jane Harper is fast-paced, suspenseful and utterly engaging. Federal police officer Aaron Falk returns to his home-town in rural Australia to attend the funeral of his childhood friend, Luke Hadler, who’s been accused of murdering his wife and child and then turning the gun on himself. Unable to accept that their son committed this terrible crime, Hadler’s parents convince Falk to help the local police with the investigation. There is, of course, more to the case than is first apparent. The town of Kiewarra is steeped in hidden secrets, including the one that drove sixteen-year-old Falk and his father out of town twenty years previously, never to return. The townsfolk make it clear that Falk is unwelcome, and the more he delves into the events surrounding the Hadlers’ deaths, the more violently they express their displeasure. Harper’s writing takes the reader effortlessly through Falk’s story. Her depiction of a rural Australian town caught in the midst of a drought is evocative. You can feel the heat, hear the flies buzzing, taste the dryness in the air. The tension simmers from the first page, and builds to a crescendo at a pace that keeps them turning. The characters are convincing and likeable. What more could you want from a good crime novel? I will definitely be looking for future works from this author. Highly recommended.